July 25, 2018 July 26, 2018 - by Paul Farol - 2 Comments. With congressman Pantaleon Alvarez out and former President now congresswoman Gloria Arroyo in as House Speaker, the rest of the Lower House’s leadership is expected to undergo changes and among the positions to be filled with be the Majority Floor Leadership. Not a few people on my timeline both on Facebook and Twitter celebrated the rise of Congresswoman Arroyo as House Speaker, with some saying that it indicated that the country’s body politic had rediscovered its dormant balls and predicted the speedy passage of President Rodrigo Roa Duterte’s priority bills. These include charter change and shift to federalism; ban on contractualization; TRAIN 2; rice tarrification; national land use act; the creation of the department of disaster management; coconut levy trust fund; and universal health care. With the interim election season looming fast along with the deadline for registration of candidates for national and local posts, the administration and its allies in legislature has three or four months to make any progress towards the passage of these bills before their focus is shifts to the political campaigning. 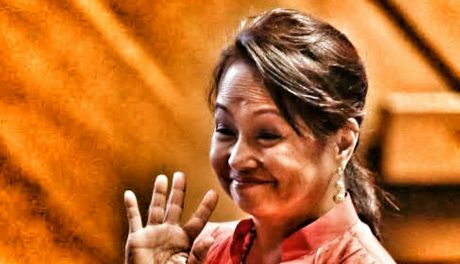 While there is no doubt that House Speaker Arroyo can wield the mace and ably lead the Lower House, she will need the support of able colleagues. Along with Deputy Speakers, the House Majority Leader fulfills a pivotal role in managing the conduct of legislation proceedings. The Majority Leader is the spokesman of the majority party and directs the deliberations on the floor. He or she is also concurrently the Chairman of the Committee on Rules. Davao City 1st District Representative Karlo Alexi Nograles, son of former House Speaker Prospero Nograles. Capiz 2nd District Representative Fredenil “Fred” Castro, who is the interim House Majority Leader. Camarines Sur 1st District Representative Rolando “Nonoy” Andaya, who also led former President Arroyo’s Department of Budget and Management from February 15, 2006 to February 24, 2010. My source notes that Nograles, although quite able, may need to mature just a little more to lead on the floor and Castro, while experienced, seems a bit tentative about filling the position. Among the three, it seems only Andaya is seasoned yet energetic and at his prime. 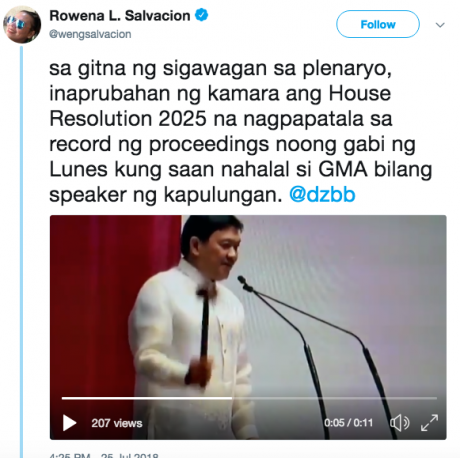 This was seen in the hours after President Duterte’s SONA when Andaya directed the course of the proceedings of the session where 180 of the 292 members of the House of Representative reaffirmed their support for the House Speakership of Congresswoman Arroyo through House Resolution (HR) 2025. Andaya rallied support for House Speaker Arroyo even as Ilokos Norte 1st District Representative Rodolfo Farinas tried to block the passage of HR 2025. According to one account, Farinas insisted that he was still the house majority floor leader and chairman of the committee of rules, at the same time questioning whether HR 2025 passed his committee. Andaya shot back telling Farinas that Deputy Speaker Fred Castro was elected as the interim majority leader and that this meant Farinas was no longer majority leader. “Yes. The majority of the members elected an interim majority leader in the person of Deputy Speaker Fred Castro and that was agreed upon by the majority members of the House,” said Andaya. After which Castro made a motion to move that HR 2025 be put to a viva voce vote. Shouts drowned out Andaya as he proceeded with the voting. He then slammed the gavel and announced the approval of HR 2025. Andaya immediately suspended the session. Supporters of the Duterte administration who observed the proceedings noted Andaya’s fiery zeal and expressed the hopes that the same fierceness would be employed in passing the President’s legislative agenda. No matter how this turns out, it seems we are in for very exciting times in the next few months. These are the, “final nails” being driven into the, “political coffin” of the Aquino Cojuango political axis. The Aquino era just ended. Politicians declared as “politically dead, have “come back to life”. The Marcoses are the next to watch. Ferdinand “Bong Bong” Marcos, Jr. is slowly rising. He may become the next President. Maybe, Imelda Marcos could become the next House Speaker. You can see this “political phenomenon”, only in the Philippines. While other politicians, who are declared as “politically dead”. Most go to retirement and fade away, enjoying their loots. Some go to live abroad, and are never heard and seen again. A man who’s well-read will always have an advantage over everyone else.